https://cdn2.hubspot.net/hubfs/644585/Bio_-_Case_Studies/NxClinical%20Software%20Sig%20increases%20efficiency%20at%20Ambry_Case%20Study%20Cover%20Page.jpg NxClinical’s multi-user system with automated and standardized processes and with a central database that automatically creates and augments the in-house case history database nimbly processes samples from Ambry’s high-throughput workflow. Ambry Genetics is a privately-held healthcare company with the most comprehensive suite of genetic testing solutions for inherited and non-inherited diseases. Since 1999, Ambry has tested approximately half a million patient samples benefiting 90% of all U.S. patients covered by public and private insurers. As a quickly expanding lab, Ambry required a growing number of reviewers to view and interpret cases in a multi-user environment. There was a need to improve transparency in array data interpretation from the Clinical laboratory to the variant assessment team and through to the Directors. Ambry needed a centralized platform whereby all data could be batch uploaded and automatically processed through one of the many preconfigured and clinically validated pipelines. Processed data could then be easily disseminated across the growing enterprise to be accessed by concurrent users, while the system keeps extensive audit trails to record any user modifications. 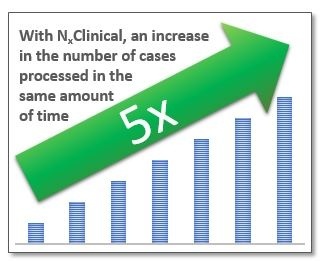 NxClinical has greatly increased the efficiency in case review and reporting at Ambry with the company now able to handle five times the case load without needing to acquire additional resources. A designated NxClinical Administrator creates the processing protocols and workflows for the different types of arrays ensuring consistency across the lab. The server based system with unlimited users and remote access removed bottlenecks in case review as Directors and other users can access cases from any location without waiting.